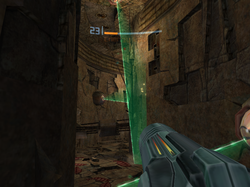 The Eyon Tunnel is a hallway in the Chozo Ruins. The tunnel connects Nursery Access and Ruined Nursery. Due to the names of connected rooms, it is assumed that the tunnels purpose was to lead from Nursery Access to Ruined Nursery. The hallway is home to five Eyons, four reside on the walls, and one on the ceiling. The room's name was probably derived from the presence of these creatures. Despite not having an open or collapsed ceiling, there are orange leaves on the floor. There are also various metallic wires and structures along the ceiling and walls, serving as evidence toward the once presence of Chozo. There is a small group of wires in the center of the hall that Samus must traverse carefully while avoiding the Eyons.